This page explains how to use the cbt command to connect to a Cloud Bigtable instance, perform basic administrative tasks, and read and write data in a table. If you are familiar with HBase, you might want to follow the quickstart using the HBase shell instead. Enable the Cloud Bigtable and Cloud Bigtable Admin APIs. 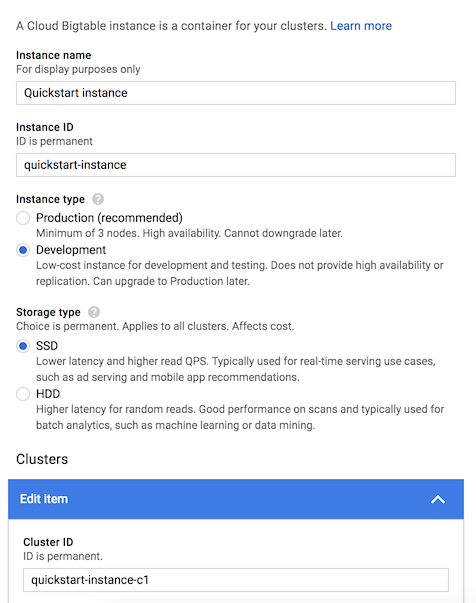 Open the Create Instance page in the Google Cloud Platform Console. For Instance name, enter Quickstart instance. For Instance ID, enter quickstart-instance. For Instance type, select Development. For Storage type, select SSD. For Cluster ID, enter quickstart-instance-c1. Install the Cloud SDK if you haven't already. Note: You can also connect using Cloud Shell, which comes with the Cloud SDK preinstalled. Now you can use the cbt command with your instance! Cloud Bigtable stores data in tables, which contain rows. Each row is identified by a row key. Data in a row is organized into column families, or groups of columns. A column qualifier identifies a single column within a column family. A cell is the intersection of a row and a column. Each cell can contain multiple versions of a value. Create a table named my-table. Type quickstart-instance, then click Delete to delete the instance. Read an overview of Cloud Bigtable. Work through a Cloud Bigtable codelab. Learn how to design your schema. View the cbt reference documentation.